I had a moment this week reminded me of when I first started work with Breakthrough. It was just me and blackberry at that point. And after an afternoon of trying to connect a printer wirelessly with my laptop in a grotty office ,which has since been knocked down, I sat down and wept. I had tried traditional methods such as swearing loudly, kicking it, going for a walk around the block but my undoing was when a friend phoned and asked how I was. The silence at the end of the phone was me trying not to sob! I was recently asked to take part in a letter to your 14 year old self and I must admit it was quite liberating. I hadn't at that age reached my Leonard Cohen fan stage or grown my hair very long ( aging hippy..yes you guessed). I was fortunate not to have too many spots as a teenager but I did carry other teenage burdens of self doubt and shyness which could isolate me at times. Oh to have had the knowledge then that I have now, mostly knowing what really didn't matter at all. That process of looking back at how you have changed and developed really is helpful. But how often do we do that or get the opportunity to capture it. There are photos that are moments in time but how reflective are they of the whole time? Blogging has been really my only experience of capturing feelings and experiences and its been helpful on so many levels. There is no doubt it's cathartic at times, it helps me process my experience and I hope will perhaps help others. But what it also is , is my own journey, reminding me of how it felt at different points and how I have also changed through this process. It's collected my reasons to be cheerful as well of course. I understand better what inspires me. I have seen my moods wax and wane . I have seen my anxieties come and go. I have seen a life in turmoil find a different rhythm again. I have learned yet again that this too will pass. If you are reading this with your own life going through change, your own turmoil, maybe try capturing it in some way. My experience is that it will help, you will recognise more how things have changed over time. You will understand your self better and see your resilience and maybe it makes the next bit, however it's going to be, just a little bit easier. I read a quote this week that said within the deeper truths there is often a paradox . I think there is a paradox inherent in making or going through change. Facing into the darkest parts makes it easier to see the light would be the one I recognise from my experience of blogging. It's been a beautiful week, cold and crisp and bright. The best kind of winter weather but with crocus spotting to brighten the day. And this week too has been about reconnecting, with friends and colleagues. In particular I spent time with the inspiring Dr David Reilly again learning more about his wonderful work helping people back to health,The WEL programme. Its a whole person approach that transforms individuals, practitioners and individuals alike. The paradigm shift that our health care approach so needs. I also have a timely day of mindfulness to look forward to this weekend and an opportunity to touch base with friends. But Cara has been a little poorly as this photo suggests so fingers crossed she will turn the corner and we can enjoy some beach walks too. Loneliness: it's the word that's been in my head this week. Why? Well a few reasons really. One of them no doubt my worry about that transition to self employment might mean a loss of being part of a team , no water cooler conversations, no deconstructing the latest film or TV show. No one to tell the weekend tales to.. But it's been OK, avoiding distraction has probably been my greater risk. And twitter conversations about love shacks ( don't ask) and such like keep me linked in! But what's clear is that it's a very real issue for many. Loneliness has a huge impact on health, affecting survival after major illness like cancer, indeed having the same impact on health as 15 cigarettes a day. Staggering, isn't it? And of course illness itself can be so isolating , particularly chronic pain or disability making many things so difficult; dementia isolating those people from the world that is increasingly scary, cancer treatments destroying health and well being for some time, depression causing withdrawal from the world. Is it inevitable then that this happens, that people become so isolated and lonely? Well , no I don't think it is. Just this week I read of a community that has been developed to have an ethos and practice of mutual support ,aimed at reducing social isolation. Investing in those very communities assets to increase social cohesion and support simple kindness. I also saw the launch of a dementia friends initiative to train members of communities about how to support people with dementia in their communities , fostering independence and connection for as long as possible. We learned too that those living with cancer are more isolated than others. Their illness and maybe their life expectancy separating them from the wider world. The message from a cancer charity who were campaigning on this was, reach out and look out for people being treated for cancer. Loneliness will compound their issues, worsen the pain both physical and mental. That's so true for many who suffer with their conditions long term. Of course there are many organisations large and small who offer support. I found the warmth and support and meditative space from my local Maggies centre an oasis in the bleak landscape that is caused by cancer. The self management fund funded by the Scottish Government and , in a fine partnership, created and managed by The Health and Social Care Alliance is an essential creative impetus for many groups supporting people across Scotland. Groups like the Pink Ladies of Midlothian who have reached out to women whose lives have been scarred by depression and other issues . Through their kindness, encouragement and belief they have changed lives for the better. For a small investment lives are turned around, the hand of welcome when people are willing to reach out , delivers so much in return. I could go on but you hear my point I'm sure, loneliness isn't inevitable necessarily but it will be if we don't act to change things and turn around the direction of travel . After all ........it might be us one day. I've been a secret shopper again this week in the NHS and once more I was impressed by a very thorough visit to a respiratory clinic. I was quite relaxed about it, not expecting miracles but open to them should they be on offer. So when I was sent for a chest X-ray, I was unprepared for the moment of fear that took over. I rationalised why this would be done and managed to return my heart rate to normal. No it was nothing to do with cancer , just a sensible base line. And it was fine, thankfully. The team were kind and the assessment was detailed. I left relieved and with a plan which I hope will help. And just a bit shattered after yet again being surprised by how the "c"word can jump up and bite you when you aren't looking. The title of this blog came to me as I was waiting to be seen, "Loneliness of the long distance cancer survivor". It does feel like a marathon sometimes , never quite knowing just where and what the finish line might be; alone in the experience and all it entails. Reasons to be cheerful. We've had a lovely family weekend, with birthdays and housewarmings to celebrate. The sun shone, the birds and flowers suggesting its spring and us all feeling maybe we can shake of winter soon. Lets hope so. Mid staffs...holding up the mirror on society? I was 8 years old when I decided I wanted to be a nurse. I had had my tonsils out and was a bit scared and definitely sore. The nurses who cared for me, made me think, I want to be like them...they make people feel better, they stop people feeling scared. I would like to do that. Fast forward a few years and I am choosing a future career on leaving school. You can't become a nurse, you should go to university was one of the main themes of advice I got. What I heard in those words was the lack of respect for the profession, the implicit why would nurses (women after all in the main...) need to be educated at university? Caring work in our culture is not valued, poorly rewarded and generally not seen quite good enough as a profession by some let’s be honest. But I found a way to do both, go to university and study nursing. I loved the course as it focused from day one on a person centred approach. Now it’s many years since I have been a nurse, but scratch the surface and it’s still a nurse you find. It's that drive to help people back to health, to ease pain, to make a system better to enable the best care, to make every person count- that makes me do what I do. The Francis report has therefore grieved me deeply. I do believe there is excellent care provided in health and social care and I have personally experienced it recently. My family however have seen both sides of the coin. A lack of person centred care resulted in a readmission, creating more fear, loss of confidence, physical decline. It could have been avoided. Organisation centred care not person centred is costly and less safe. I have said before I think this is driven by systems and targets and laws of unintended consequences in part. But I suspect-no-I know, it's more than that. Does the system drive out compassion, killing the very motivation that brought people to the profession in the first place? Do we honestly need to teach nurses and (other health care professions let’s not forget) compassion or do we need to create the right environment for that to flourish? But we do need to help health and social care professionals understand and fully embrace a person centred approach. Right now its counter cultural and that needs to be the focus for change. But what of our wider society? Is this crisis in care not in part a reflection of our wider society? Have we lost the art of caring for each other? I know animal charities see elements of this. Dogs returned for re homing because they just don’t suit any more, like an old handbag. Pets bored and under stimulated returned for scratching the furniture. Loneliness is our fastest growing long term condition, with a similar effect on health as smoking. Ageism is in part driving cultures of care. Need I go on? Its complex but we collectively must tackle this. Let’s not scapegoat a profession who deserve better and have been told for years we must focus on organisational needs like targets and budgets not caring for people. And let’s not pretend more resources or more regulation will fix this. And so I return to heartfulness……..heartful health and social care, heartful organisations to work in and a heartful society to be part of and contribute to. It’s a whole hearted/ whole system response we need. Now I’m up for making that happen…are you? Reasons to be cheerful….walking on the beach in February.My new self-employed status means I am flexible enough to plan my walks around the tide some days this week and it’s been uplifting. 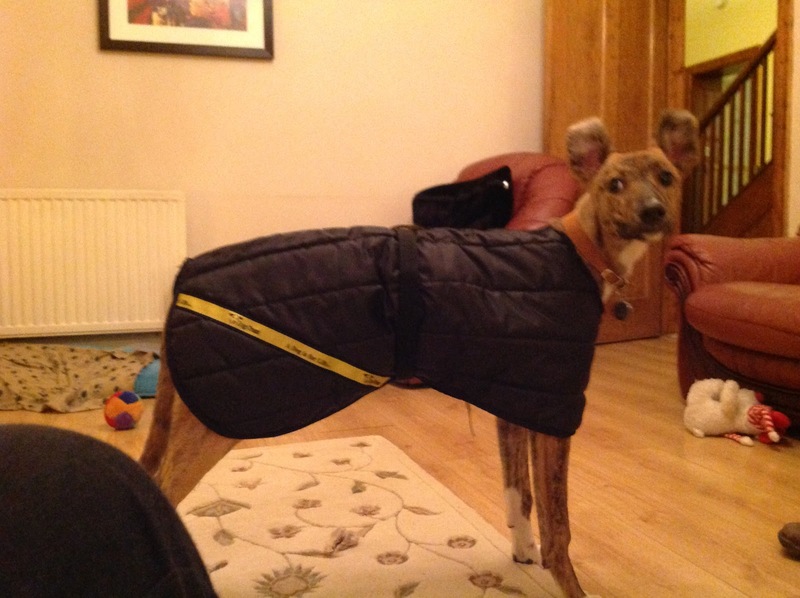 Cara has had to move up a size in her coat and as you will see she looks like she has pinched her Mums coat to wear….but she was cosy and its cold out there! If I ever write my story it will be called the woman who cried! Am I so unusual I wonder? Dont men cry? But it does seem the admission of shedding tears is still something worthy of comment.The Herald did a lovely article about my departure from Breakthrough and it was called "Crying out for attention".Not me you understand but my take home message was breast cancer is not sorted and the importance of not taking the foot of the pedal....and also the reference to having shed tears in a very public setting. Life is always unpredictable. I told you of saying goodbye to my Mum and that was complicated by a fall and stay in hospital for her, before she set off. It was with a heavy heavy heart I said my goodbye, at least until my next visit. But she hadn't been in hospital since I was born until very recently (yes I know that's surely was not yesterday!). That's a pretty good record which we are all grateful for. So when I heard more sad news this week, it immediately put all of my goodbyes into perspective. A colleague who had worked with us in The Alliance had died in his sleep after a relatively short but devastating illness. He and I sat together at dinner around 18 months ago and we discussed my recurrent cancer and my blog. I recall he spoke of my courage in expressing my journey. He also spoke of his pride in his daughter recently having graduated from the nursing degree I had done so many years previously. A loving Dad, a loving husband, a great advocate for people with heart disease and many other long term conditions, who had not told me( or many others at that time) of his own diagnosis, with motor neurone disease. The condition took its toll quickly but he continued to work, to do what he loved best with enormous courage and determination. The organisation worked hard to enable him to stay at work and absolutely I commend them for that. I am glad his passing was peaceful, it could have been so different. My thoughts are with his much loved family and his colleagues who stood by him in his time of need. He was a gentleman in all senses of the word, who cared for and about others. I am so sorry his life was shortened this way. I know he made difference through his work and at some level I hope this helps those who grieve. So I dedicate this blog ,and the poem I started with to Andy, so glad to have known you. He didn't just visit this world, he made it better. Rest in peace. I have had such love and encouragement this week. I probably have recognised properly the role the cancer has played in my decision too but I have choices and I am well now. I am so excited about starting in my new role as a coach and consultant and the difference I hope to continue to make ; supporting people and organisations to be all they can be. Thanks to my colleagues in Breakthrough for making me laugh and cry this week. Looking forward to next weeks fun night out......will try to sneak a photo! Thanks to all of you who have sent your good wishes too. Keep in touch!And thanks to to the warm welcome from the great folk at Oasis. 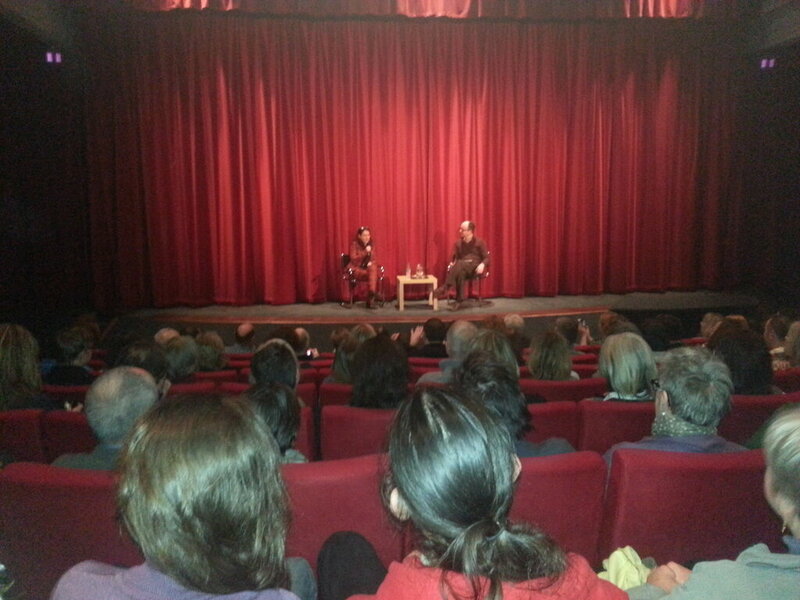 .........and finally I went to the Filmhouse in Edinburgh to see the last two episodes of Borgen. Following a fantastic couple of episodes which engaged all emotions from outrage to grief, we then experienced an interview with the actress who plays Birgitte, resplendent in a tartan suit.Bit of a girl crush lets be honest.....!